A student of St. Robert Bellarmine Parish's PREP program holds up one of the rosaries he and other students are making as part of the Missionary Childhood Association's World Mission Rosary initiative. 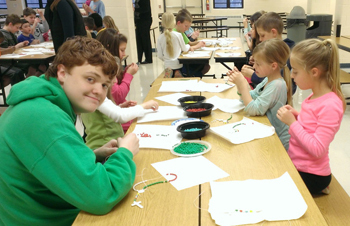 Stephen Lippincott (left) of St. Robert Parish helps younger PREP students in making World Mission Rosaries as part of his Eagle Scout project. 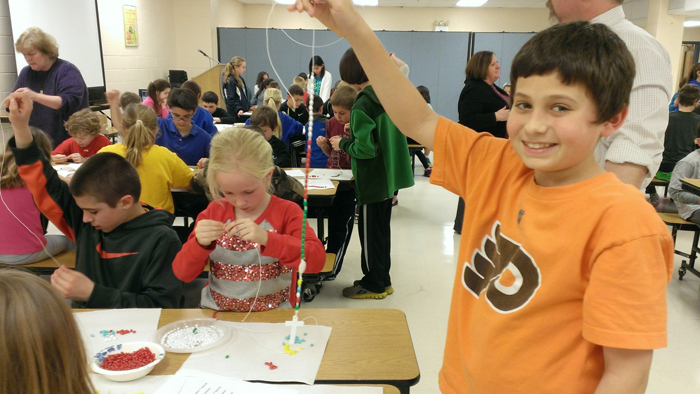 Older students of the Parish Religious Education Program at St. Robert Bellarmine Parish in Warrington helped the younger children make rosaries on April 7. Maureen Rilling, archdiocesan coordinator of the Missionary Childhood Association, led the children in praying a decade of the World Mission Rosary and shared a video from an MCA-funded school in Malawi. Stephen Lippincott, a member of St. Robert Parish, led younger PREP students in making World Mission Rosaries for the missions as part of his Eagle Scout project. In December he coordinated rosary-making efforts after Sunday Masses at his parish and St. Joseph in Warrington. Those rosaries, donated to the Pontifical Mission Societies in the Archdiocese of Philadelphia, are being distributed in Africa and Micronesia. For more information about the World Mission Rosary or Missionary Childhood Association, a Pontifical Mission Society, visit www.phillymissions.org or contact Maureen Rilling at MCA@archphila.org or 215-587-3945.